This is the seventh in a series on "born-digital" literature. Still from Jason Nelson's "i made this. you play this. we are enemies"
In this post, I'll explore the relationship of language, especially poetry, to technology, power, and control through the work of digital poet Jason Nelson, whose odd, little computer games and interactive interfaces are meant to be played, not simply read. As with all games, in Nelson's work the participant/reader becomes an integral component of the system/world established by the game. Rather than place poetry in opposition to technology, however, Nelson uses language as an adjunct technology, a means to create an additional play space, in which, since it exists only in the player's own mind, the rules no longer apply. Still from Nelson's "Game, game, game, and again game"
Like much of Nelson's work, "Game, game, and again game" addresses the dominance and demise of "big systems" -- in this case failed belief systems ranging from Christianity to capitalism. 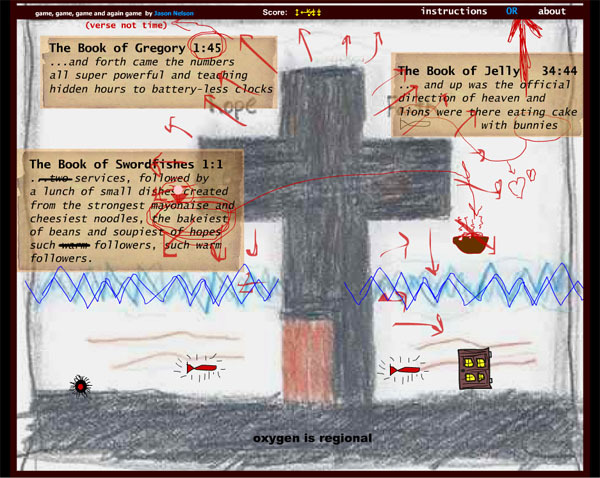 Although the interactive schema is familiar (my 6-year-old quickly learned how to maneuver a hairy creature through a dangerous terrain of scribbles and "poorly drawn bits"), Nelson destabilizes and complicates the game by rewarding the player's actions, not with points but with fragments of poetry. The wonderfully named "i made this. you play this. we are enemies" uses stills from popular Internet sites like Google, Yahoo, Disney, and boingboing as backdrop for absurdist games. Here, the sheer weirdness of the text alters the bland familiarity of these sites, mutating them into creepy virtual landscapes. Although they are composed with the vocabularies of established languages (those of television, newspapers, supermarkets, or museum sequences) and although they remain subordinated to the prescribed syntactical forms (temporal modes of schedules, paradigmatic orders of spaces, etc. ), the trajectories trace out the ruses of other interests and desires that are neither determined nor captured by the systems in which they develop. 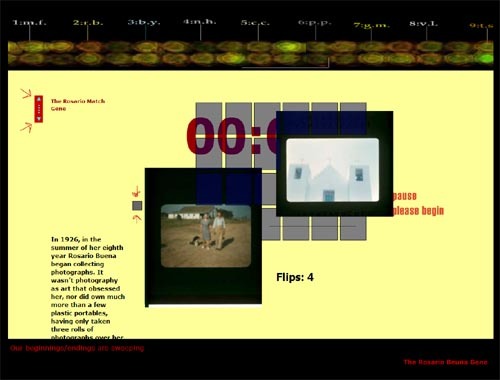 Still from Nelson's "Videograph Writing"
Like de Certeau's consumer, Nelson often repurposes the detritis and artifacts of mass media culture. 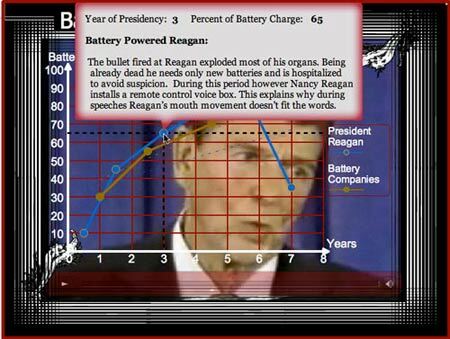 In "Videograph Writing," TV ads, newscasts, and film clips become backdrops for absurd graphs and alternative histories. For instance, in "Pac-man Dead-Eater," the y-axis is labeled "ghosts consumed." Behind the graph, Nelson runs a TV ad for a vile kid's canned food product -- Pac-man spaghetti -- to create a hilarious and acerbic commentary on the marketing of junk food to children. I asked Nelson if, apart from his own interests, he considered games to have intrinsic political potential. Could you comment on this in relation to your work? For the cat, what is the possible use for the ball of yarn? It consists in freeing a behavior from its genetic inscription within a given sphere (predatory activity, hunting). The freed behavior still reproduces and mimics the norms of the activity from which it has been emancipated, but, in emptying them of their sense and of any obligatory relation -- ship to an end, it opens them and makes them available for a new use. Curious. My brain hurts. Wandering in far too many directions. Hmmm. Where to start? At the moment I'm sitting on a couch on the third story of a mall in the Gold Coast of Australia. Aside from overlooking an open atrium with a web of escalators and crowds of tourists, there is a gym for beefcakes. Every few minutes a giant leaves, wearing a basketball jersey, with heavily inked arms and necks. They don't seem to know each other, and yet they are absolutely the same. Monumental amounts of time and cash to modify the self for sameness, and what pretends to be free expression, a permanent scar of individuality, is instead a cloning machine. And in many ways games, poetry, interactive interfaces (like menus and sliders and floating whirlygigs) are like these thickly muscled and drawn together clones. They pretend to be unique and distinct (and maybe are in a very limited way), but their sameness is needed by the world. We need to know how doors open, how phones ring and steering wheels avoid crashing. So, you and Agamben are journeying down a fascinating road. As a digital poet I want to break things, to make code and interface, language and media, software and net-lands do things, respond in ways they weren't intended to function. To take the expected response, the stimulus of reward and jumping and destroy or rethink or corrupt or caress its most sensitive parts. Still from Nelson's "this is how you will die"
As is the case with contemporary politics and corporate culture, the object of most games is to win. 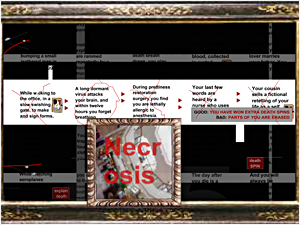 Nelson's most famous game-poem, "this is how you will die," a digital slot machine inverts this basic order. It is only when all "life credits" have been lost that the player wins the prophecy of her death. Still from Nelson's "Bomar Gene"
One form of resistance, then, is to establish a local economy, world, or system. On the individual level, this might be a process of preserving, growing, and embracing disregarded aspects of one's life, what Foucault calls the "arts of existence," which, in their smallness and lack of totalizing power or conventional goals, are overlooked or deemed ridiculous, crazy, naïve or worse, a failure. I asked Nelson if he sees this in his work. In your work, you juxtapose the personal (home movies/utterly banal photographs) and the epic/history -- the illogic of the former continually undermines, deflates the dominant corporate/historical narrative. One of my favorite works of yours is the Bomar gene -- (genetics being the primordial dominant narrative), in which mutations give people utterly absurd, and seemingly useless capabilities. For instance, the recording of the man who speaks in a language that only trees can understand ends with a repetition/translation: "Where is Roy Rogers?" I am interested in your thoughts on humor, meagerness and "failure" as forms of protest. Does the hand-drawn aspect of your work relate to this? Hey now! Sniff. Sniff. My works don't have failed/banal themes! Oh wait, yer right, I see what you mean. Before I venture off into an answer, one small bit of trivial. All the names in the Bomar Gene come from my life. Indeed Bomar is my grandmother's maiden name. Segue over. In Australia there are spiders everywhere. Even the newest buildings have spiders living in the corners. And I am super charmed by how they build these hidden worlds in the hardest to reach places. No one notices them crafting webs at the base of a ceiling trellis, and yet there is an unknown and unique world there, of no consequence to the shopper's ramblings below. Society forces us to make specific events important. Victories, weddings, awards, purchases. Tests are stumbled together to rank our achievements, to categorize and convince us of the magnitude of whatever/whatever. And yet, I think hidden within everyone and all places are small moments of beauty, absurdly unique experiences and abilities which cannot be or are rarely measured. Thunderstorms make the world small, dense and low clouds. And perhaps our greatest impacts on the world aren't our victories or news story moments in the media-sun, maybe it's the brief pause while driving so the baby ducks can cross safely. One of those ducks eventually flies into a plane's engine. And one of the crash survivor's grand daughters discovers how to use micro-black holes for traveling to distance universes. As for failure, I hate the way negativity has been injected into its meaning. Failure is far, far more important than winning or solution or accomplishment. Failure is a sibling of messy and diversion and loose-endedness. 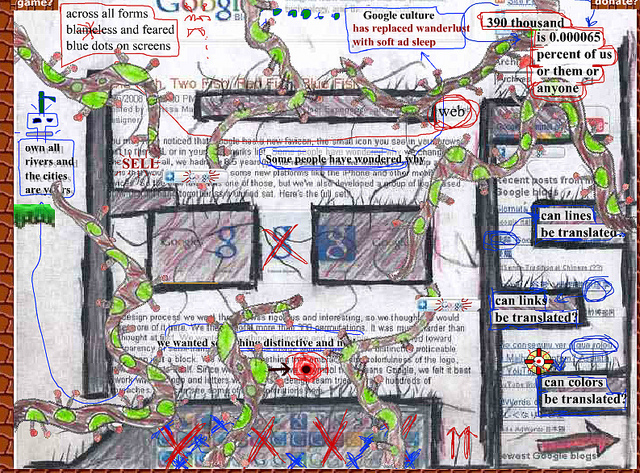 And yes, you are alarmingly right, nearly all of my works explore this extended failure family. I embrace, all arms and dryer heated sheets, how existence, physics, society, and our lives are incomplete lines, branching and scattered experiences. Our most powerful gestures are hidden spiders, making lost corners beautiful, however briefly and alone. Nelson is no neo-Luddite, staring up at the stars, longing for a pastoral existence without Facebook and processed foods. He clearly likes computer games. For him, "Video games are a language, a grammar or linguistics of various texts. The sounds, the movement, the graphics, the rules or lack of rules, everything about a video game is a component of language." Thus, for Nelson, as for other writers of e-lit, "born digital" writing is not about playing with new technologies, rather, it constitutes a critical new art which invests language with renewed potential. The next post, "Just Playing Around: Why E-lit Matters" will continue my exploration of Nelson's work.